Golden hayfields, central Turkey. View from roadside near Gordion (modern Yassıhüyük), home of the legendary King Midas. Barley identification of left, image from here. Wheat, on right. Image from here. Despite these challenges, the grassland has historically been a pantry for human use. This is true both directly and indirectly. Kernels of wheat (Triticum; Heb. 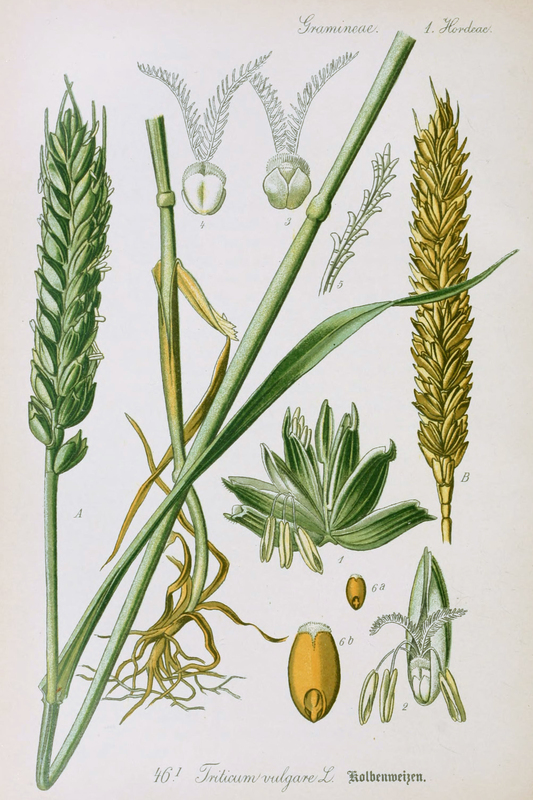 hitta) and barley (Hordeum; Heb. se’ora) are eaten raw or prepared in bread, gruel, or beer. Archaeologists suggest that these specialized grasses were “domesticated” at an early date and used to build a potent package of food production. Evidence may also be derived from the Hebrew Bible where wheat and barley lead the list of the “seven species” (Deut 8:8). They are fuel for both body and spirit: “you shall eat and be full, and you shall bless YHWH your God for the good land He has given you” (Deut 8:8-10). This, undoubtedly, is one expression of truth. Another expression recognizes the impact of human choice on this God-given pantry. People shape the environment even as the environment shapes people. I muse over this circularity. Native grasses from this part of the world were cleared away long ago to make way for their domesticated (read “best tasting” or “plumper” or “faster growing,” etc) cousins. Large-scale food production has consequences. The question that hovers over these well-worn parts of the world—and best seen through a long-term vantage point—is this: can we avoid destroying ourselves? Modern Mesopotamia suggests one answer and it is not promising. 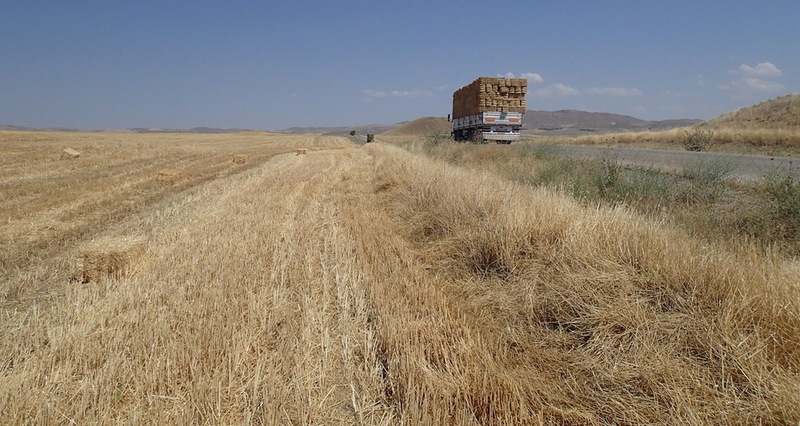 Grainfields below Boğazkale (Ḫattuša), Turkey. This was once the center of the great Hittite Empire. I’m guessing that Muwatalli II ate his Wheaties on the day he stopped the northern march of Ramesses the Great! Calories that the human gut cannot digest may be digested by others, animal others. If Mediterranean shrublands are characterized by the presence of farmers, short grasslands may be characterized by the presence of herders. Here, flocks of sheep and goat move regularly with the season, plying the edges of the zones of possibility. Flocks devour the stubble of harvested grain fields and leave valuable fertilizer in their wake. Other grazers and browsers also take advantage of these grasses, including deer (Cervus capreolus; Heb ayyal) and gazelle (Gazella gazella; Heb. sebi). Harvested fields in southern Israel. This area was once known as the "Philistine Plain." Flowers may be found in grasslands but have a short life. Their appearance is also difficult to identify with precision in the Bible. The Hebrew sosan, literally the “whiteness,” is often translated as “lily” (e.g., 1 Kgs 7:13; Song 2:2), but may refer to any number of plants including the narcissus (Narcissus tazetta) or the daisy-like chamomile (Anthrmis noblis). Interestingly, one candidate for the “rose of Sharon” (Heb. habasselet) may actually be the tulip (Tulipa sharonesis). Grasslands are a key aspect of the natural world of the bible. Understanding lifecycles here helps us be better interpreters, close observers, and responsible preservationists. Cereals in central Jordan. This is ancient Moabite territory.